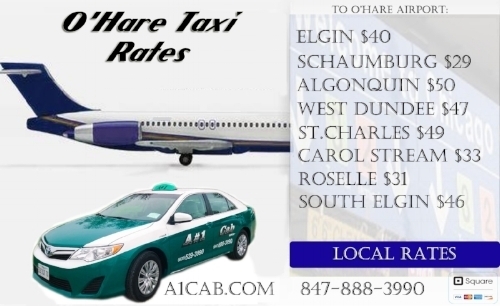 A#1 Cab Dispatch has the lowest O'Hare taxi flat rates in the Suburban Chicago area. There are no additional charges for extra passengers, tolls, or fuel. The flat rate is based per vehicle. Make a reservation today! There is a $4 ground tax fee for airport pickups only- not drop offs. This is a City of Chicago tax. Thank you for thinking of us for your transportation needs. Our Dispatch team checks all arriving flights at O'Hare airport for delays and adjusts your pickup time accordingly, with no need for you to worry about your ride. Click on the button below for all of the O'Hare flat rates in our service area. We DO NOT pickup at Midway Airport. We do NOT have taxis waiting at O’Hare airport. A ride needs to be reserved ahead of time. This is a new line of private transportation cars brought to you by A#1 Cab Dispatch. It's not a taxi and not a limo. Every car is branded with the Phoenix logos and is the same rate as the taxi line. These vehicles are commercially license plated, bonded, and insured. There are a variety of vehicles in the private car line. The experienced drivers will get you to your destination on time, whether you decide book your journey on the day or pre-book well in advance. All drivers in the Private cars accept credit and debit cards. Please let dispatch know if you will be using a credit card. Some drivers also accept Apple pay and Google pay. All rides are calculated by taxi meters, unless its an airport flat rate. No extra charges for passengers- meter price is based per vehicle. Passenger allowance is based on number of seat belts. 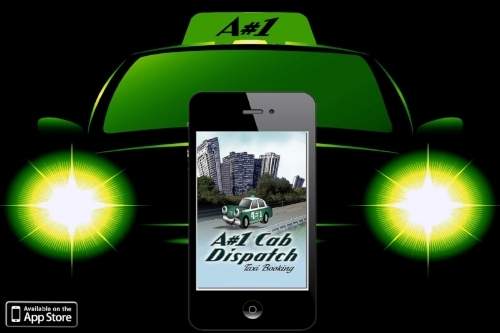 A#1 Cab Dispatch has launched "A#1 Cab- Taxi Booking" APP in 2014. It can be downloaded in the Google Play Store or the iPhone APP Store. We have included QR codes in the button link below. This unique taxi APP provides the customer with real-time digital ordering of an A#1 Cab. The customer can view the driver in route, and who the drivers is.. Once you sign up, it's quick, efficient, and worry free. We do not take your credit card information through the app ever, that way your credit card won't ever get hacked! Customers will still pay the driver for the ride, the APP will not do that for you. You may pay by cash, credit or debit. Specify how you would like to pay on the APP under "attributes". All pick ups are digitally dispatched automatically to the closest available taxi with your needs closest to you. There will be no need to call dispatch to order a taxi anymore, but optional. We have dispatchers on duty 24 hours a day. 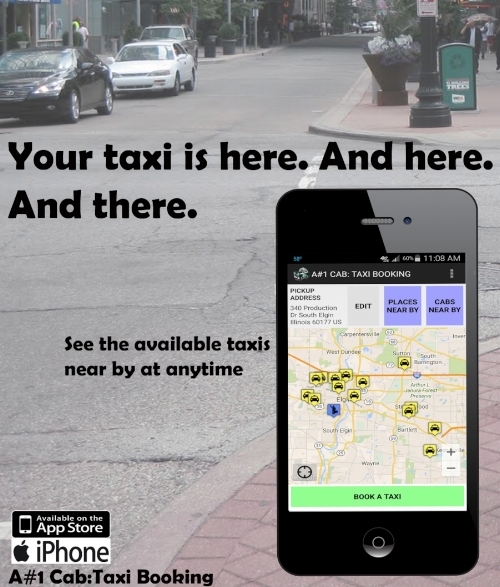 Only customers in our service area will be able to order a taxi via our smartphone app. The APP will not support other communities we do not currently service. The taxi orders will be automatically cancelled out if the pickup is not in our service area. Please check the "service area" page for the current towns/cities we service. We do not have taxis "just sitting" at O'Hare Airport, airport orders must have at least a ONE hour advance notice. Unlike other "Ride APP" providers, all vehicles contracted with A#1 Cab Dispatch are commercially insured and bonded to the State of Illinois commercial insurance standards. Which really means, the taxis have proper commercial vehicle insurance at ALL times. *There was an app update April 2016. A#1 Cab Dispatch is currently serving suburban cities and towns west of Chicago O'Hare Airport. The taxis are scattered throughout the service area for immediate passenger pick ups. Our waiting times may increase due to inclement weather. Always give yourself enough time for travel and take in consideration construction areas. We DO NOT pick up in the City of Chicago or at Midway Airport. A#1 Cab dispatched its very first ride in October 1985. This unique dispatch team serves suburban cities and towns in the Suburbs west of the City of Chicago. Our customers clearly understand that there is a difference in quality transportation and that's why they call us. Fleet operators Introduced new Hybrid vehicles and A#1 Unveiled the "A#1 Cab-Taxi APP" with specific rider options in 2014. All vehicles dispatched by A#1 Cab Dispatch Inc. are independently owned and operated by individuals or corporations. A#1 Cab does NOT own taxis or hires or employs drivers. We place drivers with owner operators to lease taxi's. Drivers are background checked though local police departments during the permitting process. All drivers are independent contractors. A#1 Cab Dispatch inspects the taxi's leased within the fleet for general appearance, working meter and toplight. All taxi's are required to be inspected by vehicle safety inspection stations chosen by various municipalities. Taxis are first regulated by the State of Illinois, and then by the municipalities that also choose to do so. A#1 Cab Dispatch additionally dispatches Private Transportation cars for Phoenix Private Transportation Group. Private transportation cars are commercially bonded, plated, and insured. Drivers are background checked. The co-ordination of transportation between the taxi on the street working and available; with the need and demand for rides. Our dispatch team works hard to insure that the demand and response for transportation is processed quickly and efficiently. A#1 Cab Dispatch, the self-contracted drivers, and the owner operators do NOT transport minors under the age of 16 without an adult, and are not involved in any type of school transportation or government subsidy accounts. Can't find what your looking for? Try the search below.